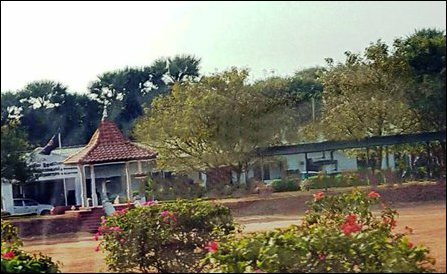 SL Air Force built ‘military-resort’ in Keappaa-pulavu has also become an ‘exclusive’ resort for Sinhala visitors from South. A Buddha vihara is also being constructed inside the occupied zone, all in the lands occupied from Tamil families at Keappaa-pulavu. The SL ‘Resttlement’ Minister has also selectively invited Tamil activists in North for a ‘military conference’ on land issue to be held on Monday in Colombo. SL Air Force at Keappaa-pulavu is engaged in constructing new buildings inside the occupied zone while people are waging protests outside the military cantonment. Hundreds of acres of agricultural lands are also occupied by the SL Air Force in Keappaa-pulavu. The multifold military deceptions are being facilitated through D.M. Swaminathan, the SL ‘Resettlement’, ‘Prison Reform’ and Hindu affairs minister. The occupying Colombo regime, unable to tolerate the escalating continuous protests, has approached the ITAK hierarchy, particularly its broker M.A. Sumanthiran as a last-ditch effort to contain the struggle. The ITAK hierarchy was taken for a ride through a selected route inside occupied military zone in Keappaa-pulavu as the military commanders requested Mr Sumanthiran to convince the protesters to come to a compromising settlement with alternative lands and housing schemes. The SL military was only prepared to release around 100 acres of lands, that too in remote areas of Keappaa-pulavu. In the meantime, a new protest has gained momentum just outside the largest SL Navy cantonment in Mullaiththeevu this week. The ‘SLNS Gotabaya’, situated in more than 300 acres of private lands of uprooted Tamils and 200 acres of public lands of the country of Eezham Tamils, comes under the so-called Eastern Naval Area of the occupying SL Navy Command, which has its central command at Trincomalee. The ‘Gotabhaya’ camp was initially launched as a Naval Deployment (ND) in January 2011 and was later upgraded as a Commissioned Naval Base (CNB) with the title ‘Sri Lanka Naval Ship Gotabhaya’ in 2012. It has become a ‘Regional Security Centre’ of the occupying Sinhala Navy, monitoring the coastal belt of Mullaiththeevu. The entire coastal belt of Mullaiththeevu is being occupied by Sinhala fishermen from South with the backing of SL Fisheries Ministry and its Fisheries Department. In Mannaar, Tamil Catholics were mobilized in a large protest from Mannaar St Sebastian Cathedral to District Secretariat on Wednesday in support of the uprooted Tamils from Mu’l’lik-ku’lam. The protest in Mannaar was conceived as a district-wide mobilization of Catholics demanding their lands that have been occupied at several locations by the SL military. Tamil Catholic protesters in Mannaar carrying slogans condemning the SL State. One of the slogans says: “We don't need a leadership that cannot understand the minds of Tamil people”. The slogan was targeting Sampanthan and Sumanthiran in the ITAK hierarchy. Although ITAK leader Mavai Senathirajah and Sivagnanam Shritharan were ‘programmed’ to express solidarity with the protesting people, M.A. Sumanthiran was brokering ‘step-by-step’ approach as a deception to contain the protests that have gained momentum in Mullaiththeevu and in Ki’linochchi. The appeal of Mannaar Catholics, addressed to SL President, was handed over to SL Government Agent in Mannaar by the protesters, who were led by Bishop Emeritus of Trincomalee and Apostolic Administrator of Mannaar Right Reverend Joseph Kingsley Swampillai. The Catholic protesters in Mannaar demand the SL President to release the military-occpied lands of Mu’l’ik-ku’lam people, who have a continuous history of livelihood at the village of Mu’l’lik-ku’lam since 16th century to September 2007, when the SL military evicted them with a promise of resettling them within 3 days. In January 2013, Colombo-based Sinhala Archbishop and a Cardinal of Vatican, His Eminence Malcolm Ranjith, came with genocidal Colombo’s Defence Secretary and presidential sibling Gotabhaya Rajapaksa in a deceptive move of permanently grabbing Mu’l’lik-ku’lam village from the Tamils. The protesters said they would be launching similar protests at Thalai-Mannaar Pier where SL Navy has seized 10 acres of lands belonging to the Catholic Diocese of Mannaar along with a church with 100 years of Catholic legacy and at Vangkaalaip-paadu (2 acres of a palm grove), Pa’l’li-munai (22 houses with lands belonging to fishermen) and at Minaa’raap-paadu at Erukkalam-piddi where several acres of lands belonging to the Catholic Diocese that have been seized by the SL Navy. Tamil-speaking Muslims in Musali are also engaged in a continuous protest just 200 meters away from the protest site of Mu'l'lik-ku'lam people demanding SL President to cancel a Gazette notification that intends to absorb residential lands of Muslims in Ma'richchuk-kaddi as Forest Reserve belonging to Vilpattu reserved forest. 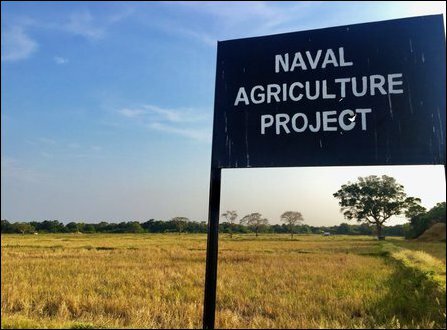 Apart from the coastal stretch of Mu'l'lik-ku'lam, the occupying SL Navy has also seized hundreds of acres of fertile agricultural lands in Musali. 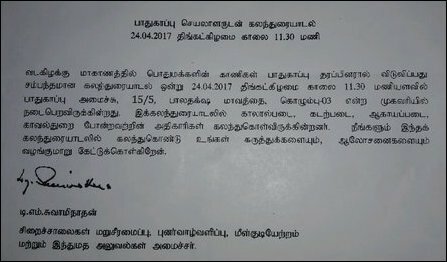 17.04.17 Genocidal Sri Lanka erects Buddha statues in Muslim areas in..
14.03.17 Colombo's structural genocide against Eezham Tamils reaches ..